It was bumper-to-bumper at the boat ramp on Monday night. THE Gazette reports today that the Derwent Valley Council will set up a temporary campground to take pressure off the Millbrook Rise boat ramp at New Norfolk. Mayor Martyn Evans is quoted saying that self-contained motorhomes will continue to be able to make daytime use of the boat ramp but those staying overnight will be directed to an adjoining paddock that will be opened up for the purpose. The move is in response to ongoing concern about the number of campers of all kinds taking advantage of free use of the boat ramp for overnight stays, despite signage saying the area is for self-contained recreational vehicles only. The public toilets at the boat ramp use septic tanks and cannot cope with the additional use by overnight campers. In recent months the council has been handing out a notice to campers at the boat ramp, pointing out that the self-contained restriction was due to misuse of amenities and vandalism. Complaints have included blocked access to the boat ramp and damage to the public toilets. Users of the WikiCamps mobile app have been warning for months that continued abuse of the site was likely to see it closed to all campers. In a post dated January 27, one WikiCamps user wrote: "Another great spot getting ruined by bogans and backpackers leaving toilet waste everywhere and going to get another free site closed." Another wrote on January 30: "Totally amazes me how some people can't read signs. It says self-contained motorhomes and caravans only ... the tent and 4x4s parked overnight must have come in after the ranger came round." Another wrote on February 1: "If this beautiful camp is closed it will be due to the rude arrogant grey nomads who insist on dumping their waste into the public toilets, which creates havoc with the system ... so lazy that they can't drive a couple of kilometres down the road to the dump point." The Millbrook Rise boat ramp was the subject of discussion at a closed council meeting last Thursday night, with general manager Greg Winton submitting a late agenda item as an urgent inclusion in the meeting. Afterwards the council announced that it had approved the trial of a new area for self-contained campers and that the boat ramp would in future be for day-use only. 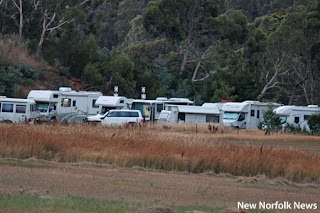 Mayor Evans told the Gazette that signage at the temporary campground would provide information about the location and services of the New Norfolk Caravan Park, which includes an area for RV parking for $9 per night.